Milan is one of the largest cities in Italy, located in the plains of the Lombardy region, and is one of the most highly developed urban centers in Europe. The Municipality has a population of 1.3 million. 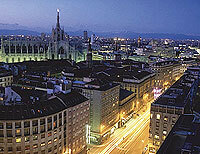 The Milan metropolitan area, depending on the specific definition, has a population ranging from 3.9 to 7.4 million. Milan is one of the major artistic centres of northern Italy and is also renowned as one of the world capitals of design and fashion. Milan is also one of the major financial and business centres of the world: with a 2004 GDP of €241.2 billion (US$312.3 billion) the Milan metropolitan area has the 4th highest GDPs in Europe: were it a country, it would rank as the 28th largest economy in the world, almost as large as the Greek economy. The city is the seat of the Italian Stock Exchange and its hinterland is the largest industrial area in Italy. Milan was included in a list of ten "Alpha world cities" by Peter J. Taylor and Robert E. Lang of theBrookings Institution in the economic report "U.S. Cities in the 'World City Network". Today Milan is a major centre for the production of textile and garments, automobiles, chemicals, industrial tools, heavy machinery, book and music publishing. 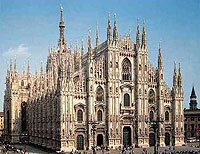 Milan is also considered to be the fashion center of the world. The place has headquarters and businesses of some of the leading international designers. The new fair ground, in the north-western suburb of Milano-Rho which was opened in April 2005, makes the Fiera Milano the largest trade fair complex in the world. Milan will host EXPO 2015 as a renewed city in the wake of this modernization. 'I've Seen Films' will take place in the Spazio Oberdan venue, in viale Vittorio Veneto, 2 (on the corner of Oberdan square) very close to the city center. This is a 200-seat theater where films belonging to Fondazione Cineteca Italiana, as well as Province of Milano thematic retrospectives, are screened. There is also an 700 sq. mt. area where contemporary Art and Photography exhibitions take place. 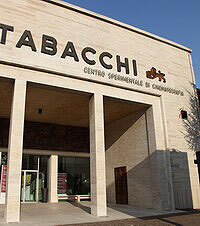 In addition to that, an information desk offers updates and news on the main national and international cultural events, and a box office sells tickets to attend Italian and international shows, exhibitions and museums. The 'I've Seen Films' Gala Award evening will take place here on Friday, October 19, 2012. Anoter 'I've Seen Films' venue will be the new Centro Sperimentale di Cinematografia - Sede Lombardia's theater, located in the film center of the former Manifattura Tabacchi in viale Fulvio Testi 121 in Milano. This theater, opened in December 2011, is equipped with the most advanced screening technnologies and is managed by the National Film School and the Milano Film Museum. The Centro Sperimentale di Cinematografia (Experimental Cinematography Center) Foundation is one of the most prominent institutions in the world for film education, research and experimentation, in its wider meaning: film, documentary, fiction, advertising and animation. 'I've Seen Films' will also take place at the Institut Français. Founded in 1949, the Institut Français in Milano is located in the renowned Palazzo delle Stelline, across from the Santa Maria delle Grazie Basilica. This institution, directly linked with the French Ministry for Foreign Affairs, promotes the French language and culture. In addition to the famous French language courses, it offers a rich cultural season, held both in-house and ‘hors les murs’, which ranges from arts to music, from theater to dance and from lectures to design. 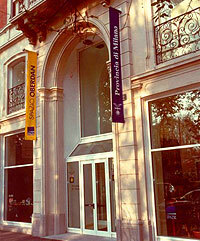 The Institut Français cooperates with the major institutions, theaters and festivals in Milan and northern Italy. Its screening room offers a comprehensive French language film season along with other special events such as premieres and retrospectives.